These tasty snack bars give you energy for sustained endurance while climbing, hiking, biking, swimming and working out. Made from 100% whole, organic ingredients, they taste great and are easy to pack out in the mountains and woods. These nutrition bars will sustain your adventure outdoors. With a mixture of whole grains, protein and fiber, clif bar gives you the energy to push your limits. Have a great snack for the weekend, buy Clif Bar. Luna Lemon Zest Bar - 1.7 oz. Clif Mojo Crunch Cluster Electro Almond Sea Salt - 1.06 oz. Clif Mojo Crunch Honey SriRocka - 1.06 oz. Clif Mojo Crunch Fingerpickin Barbeque - 1.06 oz. Clif Chocolate Brownie - 2.4 Oz. Clif White Chocolate Macadamia Nut - 2.4 Oz. Clif Whey Protein Coconut Almond Chocolate - 1.98 Oz. Clif Whey Protein Peanut Butter Chocolate - 1.98 Oz. Clif Whey Protein Salted Caramel Cashew - 1.98 Oz. Clif Kid Zbar Iced Oatmeal Cookie - 1.27 Oz. Clif Zbar Kid Zfruit Strawberry Snack Bar - 0.7 oz. Luna Protein Cookie Dough Bar - 1.6 oz. Clif Nut Butter Filled Bar Chocolate Hazelnut Butter - 1.76 Oz. Clif Nut Butter Filled Bar Chocolate Peanut Butter - 1.76 Oz. Clif Nut Butter Filled Bar Coconut Almond Butter - 1.76 Oz. Clif Nut Butter Filled Bar Peanut Butter - 1.76 Oz. Builders Snack Bar Chocolate Mint - 2.4 oz. Builders Chocolate Snack Bar - 2.4 oz. Builders Snack Bar Cookies and Creme - 2.4 Oz. 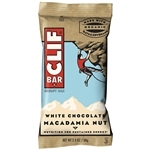 Clif Snack Bar White Chocolate Macadamia - 2.4 Oz. Clif Carrot Cake Snack Bar - 2.4 oz. Clif Chocolate Brownie Snack Bar - 2.4 oz. Clif Oatmeal Raisin Walnut Snack Bar - 2.4 oz. Clif Cool Mint Chocolate Snack Bar - 2.4 oz. Clif Blueberry Crisp Bar - 2.4 oz. Clif Peanut Toffee Buzz Snack Bar - 2.4 oz. Clif Sierra Trail Mix Snack Bar - 2.4 oz. Clif Peanut Butter Banana Dark Chocolate Bar - 2.4 oz. Luna Chocolate Dipped Coconut Bar - 1.7 oz. Luna Nutz Over Chocolate Snack Bar - 1.7 oz. Luna Lemon Zest Snack Bar - 1.7 oz. Luna Caramel Nut Brownie Snack Bar - 1.7 Oz. Luna Smores Snack Bar - 1.7 Oz. Clif bars are used by 90% of big wall climbers and mountaineers in the world for their multiday ascents.